81 total items that I can current see on this merchant. 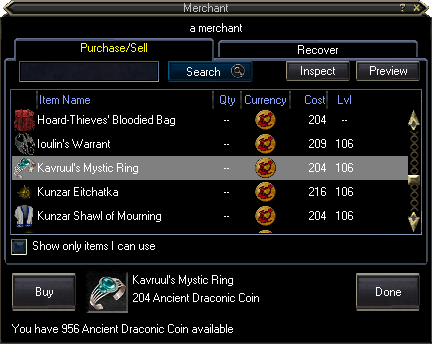 Two additional items for sale on this merchant: Enchanted Spirit Wracked Cord and Kavruul's Mystic Ring. Note the quantity of 81 while your list shows only 80. The reason that I was testing out hiding the merchant list behind a /spoiler tag is so YUGE unwieldy lists wouldn't be cluttering up the comments section so that people perusing the web page can quickly and easily see pertinent additional information in the comments section that others may have submitted. Thanks. It looks like we were missing the Enchanted Spirit Wracked Cord. Added that one. Also the merchant listing is fine. We have a parser that takes the log entries and auto sorts them out into the NPC database table. It appears that the parser that you are using to scrape merchant data from user posted logs may not work well under a /spoiler tag, so I'll just leave any logs I upload in the future without any tags to avoid any further issues. Thanks for the detail. We can add items individually so it's not a big deal if you can't supply a merchant list but it's much quicker when we add items in bulk. 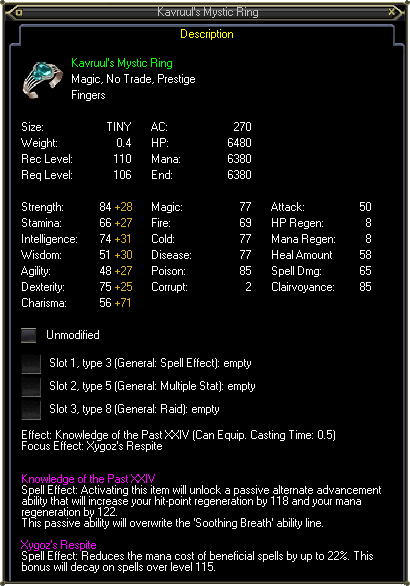 Anyways, added Kavruul's Mystic Ring to a raid merchant.